Description: Super Sparkle is here to save the day, but even superheroes have bad hair days and she needs your help to give her a hairstyle makeover. 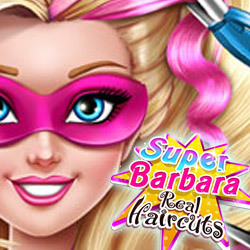 Enter her secret lair and give Barbie`s alter ego a brand new colorful haircut. Trim, curl or dye her hair in different styles, add sparkly accessories, then choose a super outfit and cape to finish her amazing transformation.